I worked with Marissa and she was extremely professional and did an amazing job of capturing my work history much better than I could have myself. She was genuinely interested in “my story” and portraying that accurately on my profile. I have recommended LinkedIn-Makeover.com to several friends already and will continue to do so! Laurel Dowswell did a great job of tweaking my existing LinkedIn profile to make it more of a “branding document.” She was very receptive to my desires and offered very constructive feedback. I would recommend these services to anyone wanting a fresh approach to successful branding. Quick and explained my past better than even I could have! My Branding Specialist was great. On top of simply writing up a good LinkedIn profile, she was very great to work with and had numerous very good ideas to enhance the impact of my profile. I thought the process was extremely well done. The person who worked on my profile listened to me, and then communicated my values and experiences in a very succinct but compelling final form. Very thorough and professional. Your service was excellent, it was everything that I was hoping for. The quality, format and content was nearly perfect. Wendi was really great – listened closely, drew out important information and then crafted a great LinkedIn profile for me. A great investment. Great service! Suggestions to improve my profile that I had never considered. Expert consultation resulting in expert outcomes. Thanks again for all the help! It was definitely a worthwhile investment. My true credentials came out to be much more impressive in the new format. The result was a great resume and… a new job! I contacted LinkedIn-Makeover.com on a Thursday afternoon with an immediate need of an updated resume. I had received an unexpected opportunity, but I needed to have a great resume by the following Monday. LinkedIn-Makeover.com assigned a great resume writer that worked over the weekend with me, writing and revising my resume, until it met my satisfaction. The result was a great resume and… a new job! Efficient and accurate. Good experience and saved me a lot of time! LinkedIn Makeover does an amazing service. Although I am going to grad school in the Fall, I have been flooded with messages by recruiters and have made connections that will be beneficial in the future. Great work, they turned around what I didn’t like in an excellent description. Strongly recommended. I worked with Jill J and she was wonderful. The data collection form is comprehensive and gives the writer lots of material to work with. Also the two phone sessions were invaluable in capturing and clarifying information. My profile looks fantastic and markets my capabilities in a way I could never have done by myself. Thank you. Your staff was professional, knowledgeable, pleasant to work with and extremely helpful. I was very satisfied with their work product. The way you understood my requirements and interpreted the combination of skills and personality was very impressive…I am extremely happy though with my new look profile. I thought the profile not only really captured my background and accomplishments but did it in a very engaging way. It was easy to sign up and go through the process. Ashley was the perfect person for me and I am so happy with her work. I learned a lot from her! The work of LinkedIn-Makeover.com has been valuable, impactful and professional. I highly recommend getting yourself a Makeover for your page. Friendly, no pressure, service, and a staff who works with the client to make a killer LinkedIn presentation. I have referred over 15 people to Donna and her company. She is hands down the best LinkedIn Makeover company out there. After using her service, I received 2 of my last job offers. They found me thanks to my stellar LinkedIn profile. I can’t recommend her more highly. It is worth every penny. Invest in yourself and work with Donna and her team to put your best foot forward! Overall, great experience (even had my wife sign up too). I am blown away by the quality of work produced. The personal interview was a great touch and I’m glad I went with this package. My only regret is I didn’t do this sooner. Hi Donna, My LinkedIn Makeover that your firm created is outstanding! Wendy Blessing did an amazing job on the profile and Alison Lorraine did an amazing job on my resume and cover letter! A million thanks, you guys rock! Pam was great–fun to work with and very skillful. She’s also very good at keeping the project on track! It was so exciting to have an expert consultant as my guide to helped me tell my unique story on LinkedIn! The business results were excellent! Pam was amazing. She took her time to get to know me and write with her best judgment what represented me the most. I am very pleased with the high-level writing skills applied to my LinkedIn profile. I worked with Jan Stone. She was great, professional, knowledgeable and very responsive. The real make-a-difference aspect was her ability to ask me good questions, listen to my reply, then give me feedback without making me feel silly because I have not been in a personal search for a long time, and then only once. I enjoyed speaking with her. The attention was very good. The service was excellent. From the very first time I contacted LinkedIn-Makeover.com, I received excellent service. E-mails were answered rapidly, and calls were scheduled to discuss the Makeover. What a terrific team of professionals! I highly recommend their services! Great service, friendly, helpful team. Highly recommend the makeover for people who have not had to do a resume for a while. I really appreciated the level of professionalism and the manner in which my voice came through your writing. Your LinkedIn service was excellent. Extremely useful and I got really good feedback from Heather Maigur who did my profile. Donna and Dionne, I would like to Thank You and Your Team for once again ‘knocking it out of the park’ with my recent Linkedin Update. Pam Allen is a tremendous asset for your organization! She is a true professional and outstanding writer that completed a first-class original Profile and then again on the Profile Update! Best wishes for your company’s continued success! Because I’m a writer, I was initially hesitant about having help with the revisions of my profile and whether or not someone else would attempt to shape my thoughts of myself in ways that might lead to a professional profile, but might not reflect who I am. My concern was needless. The LinkedIn Associate who took the lead in reviewing and ultimately revising my profile was not only a consummate professional but also completely personal and understanding of my hesitations. She worked diligently with me to find both the professional tone that my profile needed, but also to be true to myself in the ways that mattered to me. She listened to me carefully, figuring out what I was struggling to identify how I truly wanted to be viewed on LinkedIn. Subsequently, she created a profile draft that we reviewed together with very few changes, for she had captured all that I had hoped for in the language of LinkedIn, which is exactly what I needed. If need be, I know that I can reach out to her again and she would respond with professional knowledge and personal attention to detail. Thank you, Heather, many times over. Hi Donna! As I let you know, you and Heather have transformed my profile, organized my work history and given me new confidence in my job search. Thanks! I already have recommended your services! Laurel was an amazing associate with whom to work. She really brought my "story" together in a clear and easy-to-understand way. The entire process was seamless and I definitely feel like the cost was an investment in myself. Professional service in a timely manner and a thorough and high-quality final product. Completely satisfied and glad I outsourced it to the pros! The revised profile nicely reflects what I wanted it to show. The branding specialist I was assigned to listened to what I wanted. Also, after the initial version was created I was allowed to give my feedback and have a phone call. She discussed the changes and made a few further revisions based on what I suggested. I really appreciate the professional work and the personal attention I was given. Loved every part of it, especially your team! I loved my LinkedIn profile builder. Extremely professional and accurate, she worked magic. The coaching experience has been great too. Thank you so much, have already referred the service to many others and will continue to do so. Thanks for making my Frankenstein resume into a 2-page piece of magic I can be proud of! Where did my LinkedIn Posts go? How Often Should You Update Your LinkedIn Profile? I LOVE LinkedIn! But I am not endorsed by or affiliated with LinkedIn in any way whatsoever. There is NO relationship or affiliation with, sponsorship, or endorsement by LinkedIn with this Website. Absolutely NO content has been authorized by or represents the views or opinions of LinkedIn or LinkedIn personnel. 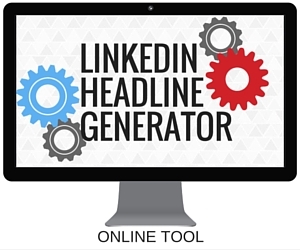 LinkedIn Makeover is simply a description of a service I provide. My company is called Vision Board Media.